Plantsbrook School occupies the site in Upper Holland Road where once stood Holland House. This was a big house whose ornamental grounds extended over the land now occupied by Town School and Holland House School, and was in its hey-day in 1900 when the wealthy Jerome family lived there. Mr. John Jerome had inherited the property on the death of his brother in 1861, and the 1871 census records him as being a 32-year old Gun Barrel Manufacturer; his wife Mary was older than him, and there were five children under the age of eight. The household was completed by four live-in servants. In 1861 the house was almost surrounded by water, as there was a series of ponds used to harness the E Brook to power a water mill. Mr. Jerome demolished the mill and drained most of the ponds, keeping one as an ornamental feature when he laid out the gardens. His brother Charles, from whom he inherited, was a gun barrel maker employing eighty men and boys, mostly at his Birmingham factory, but at least four of his men were employed as gun barrel grinders at the Holland House mill. For over a hundred years Holland House had belonged to the Oughton family, and was only sold to Charles Jerome on the death of Mrs. Oughton in 1859. She had kept the gun barrel business going after the death of her husband, John, ten years before. The 1841 census shows that her mother, the 87-year-old Mrs. Elizabeth Vaughton was living with them at Holland House; she was gentry, being the widow of Mr. Vaughton of Ashfurlong Hall - he was High Sheriff of Warwickshire in 1804. John Oughton, who was Warden of Sutton Coldfield in 1813 and 1814, succeeded his father Joseph at Holland House; Joseph was Warden in 1782, showing that the Oughtons were respected gentlemen rather than upstart tradesmen. This Joseph’s father, another Joseph, was listed as a governor of the Grammar School in 1762. In a marriage settlement deed in Birmingham Reference Library dated July 20th 1763 Joseph Oughton gunsmith of Birmingham conveys property to his son Joseph and his intended bride Miss Whately (also of a Birmingham gunmaking family). The property is described as Stonebed Meadow, a mill, a messuage, and land, all in Sutton Coldfield - a messuage was a dwelling house, so this shows that Holland House was there in 1763. 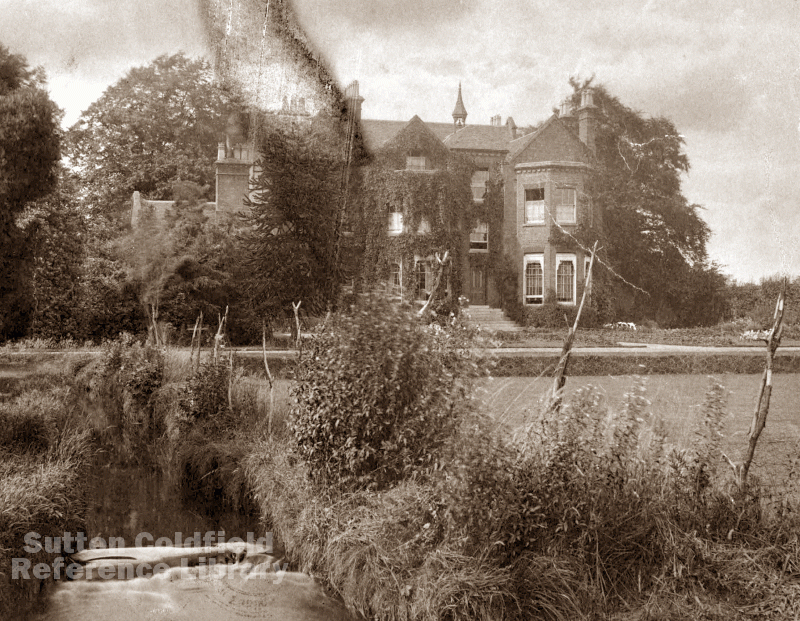 Holland House from the rear, with the stream flowing towards the camera - the best photo I could find of Holland House, probably c1920. In 1840, according to Riland Bedford, “its ponds and canals came quite up to the windows of the building” and it was “now (1891) much enlarged and modernised”. (photo courtesy Sutton Reference Library).